a. This employee does not exist on your MYOB - it means that the employee from Small Builders has not been saved yet to MYOB. i. Click on Contacts found under the MYOB tab. ii. Tick the checkbox of the employee you want to select, then click Integrate. i. 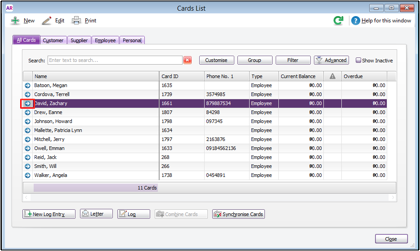 Go back to your Cards List in MYOB application. Click the arrow beside the name of the employee. ii. Set up Payroll Details for the transferred employee. a. Under Card Information, go to Payroll Details > Wages. b. Select Hourly as pay basis. c. Under the Wage section: tick all that apply. d. After inputting the details, click OK to save changes. 2. Transfer Timesheet submissions from Small Builders to MYOB. To do this, go to Management > Integration > MYOB > Timesheets > Register. You will notice that the employee is no longer highlighted in red. 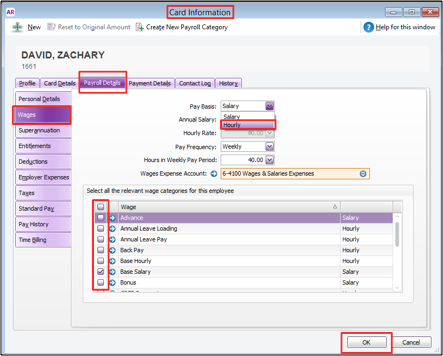 The Payroll Category is based on the relevant wage categories you set for the employee in your MYOB. Tick the checkbox for that employee, and then select Payroll Category. 4. To check if you did the integration correctly, go to your MYOB. Go to Payroll, then select Enter Timesheet. Search for the integrated employee, then click his/her name or click Use Employee.